The Museum Building built built around 1890 has a history with Pianos Having been Agents for W.H.Palings Pianos before 1915. Beautifully Crafted Art Case Cottage Piano By John Broadwood Circa 1877. Superb example of the Golden Era, Piano By Carl Scheel. Circa Late 1870's Carl Scheel worked under and with the genius Sebastien Erard, becoming in his own right a brilliant Medallion winning piano maker. The piano has an amazing history you can find out about in our Museum Booklet. Located in the beautiful Neville village, is the Golden Era Piano Museum. The building was built in the late 1800’s and is of timber open cathedral type construction. It oozes character from another time. An agent for Palings Pianos in 1915. The museum has a history with Pianos having been agents for Palings Pianos before 1915. The building has been used as a Bank in 1913, Gas Station, Movie Theatre, General Store and Post Office, it has an interesting history. 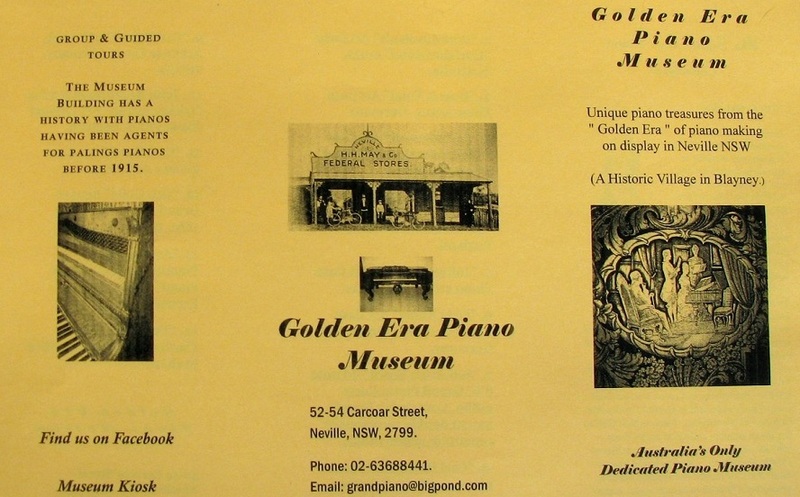 Today, transformed into the Golden Era Piano Museum it is the only Piano museum in Australia. It is the perfect venue to learn more about pianos. A living museum, visitors can hear instruments in fully guided tours available weekends and by appointment weekdays. Around the turn of the twentieth century a period of prosperity inspired an interest in culture and the arts. now known as the “Golden Era”, this wonderful period of piano supremacy was from approximately the 1860’s to 1914 ending with the commencement of the first world war. As one of the only sources of music in the home, the domestic importance of the Piano was at its peak. At this time the mechanism or action, was fully developed by Sebastien Erard making the most complex and delicate works possible. The wealthy commissioned bespoke, Art cased pianos as visible status symbols to stand as centrepieces in a room. International competitions were held to award ” Golden Medallions ” to the winners. Pianos in the “Golden Era Piano museum are by those brilliant and innovative makers who achieved Golden Medallions. Other technical innovations of the instrument had reached maturity prompting a flourish in custom made, luxurious cases. The breathtaking craftsmanship illustrated by these pianos reflect a climactic time in piano making and stand as monuments to the position of the piano in social history. Open Saturdays, Sundays & Long Weekends from 10.00am to 4.00pm. Open Public holiday Mondays 10:00 - 15:00. Guided tours available by appointment.